There has probably been more nonsense written about rispetto, or "respect," among mafiosi than about any aspect of the organization. For example, important dons are shown "respect" when assassinated; it is required that they be shot from in front, that they have the right to know they are being killed with the proper decorum. Actually Mafia hits, regardless of the target, are made as quickly and efficiently as possible. Often the rubout occurs while victims are dining. Since they are usually sitting with their back to a wall, a shot in the face is more practical than polite. And a shot from the front also eliminates errors of victim identification and, ultimately, is more likely fatal. Possibly one of the few truly respectful Mafia killings was that of mobster chieftain Willie Moretti. Very popular with most of the Mafia, he was erased in a "mercy killing" because he was "going off his rocker" and babbling too much. He was shot in front. In 1985 Gambino crime family boss Paul Castellano was shot from in front as he got out of his limousine, but then few people get out of automobiles backwards. In major Mafia rubouts, such dons as Salvatore Maranzano, Albert Anastasia and Sam Giancana got absolutely no respect in the way they were killed. A longtime boss, Vince Mangano, ended up permanently missing and thus allowed not even a funeral, hardly a sign of respect. When the would-be assassin of Frank Costello called out to him, "This is for you, Frank," before firing, he probably was not trying to make Costello turn and take the bullet in the face. He was more likely trying to freeze a moving target. Regardless of assassination modus operandi, Mafia bosses are treated with deference. They demand it and they get it, not out of respect but out of plain fear. In Sicily the gabelloti (loosely, tax-men), mafiosi who kept order on great estates and then came to own them, earned respect for their capacity for violence. A corporation executive earns "respect" from his underlings because he can sever them. A Mafia boss severs his inferiors; only the method varies slightly. It is hardly surprising that mobsters scrape and bow before their boss, speak in hushed tones, hold doors, offer seats and speak only when spoken to. According to one son of a New York family boss: "My father would light a cigarette and five people would jump to push the ashtray close to him. At dinner, people would wait to speak until he spoke to them. If he put down his fork, you stopped eating, even if you weren't finished. My father was god to everybody." 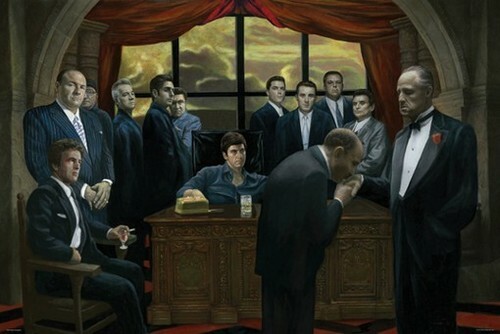 Respect has come to have an entirely different meaning in the modern American Mafia. It is a quality dominated by the dollar sign. Top mafiosi demand their underlings show respect by turning over a portion of their illegal earnings. A mobster who bows and scrapes but gives no money is a candidate for a car trunk. Similarly, when members of a crime family move on to the turf of another don, he takes offense because this is not showing respect—and appropriate revenues that should be his. As informer Vinnie Teresa has pointed out, New England Mafia boss Raymond Patriarca demanded respect by getting a piece of the action on everything that went on in his domain. He always took a piece of the profits but never a piece of any losses. Once Patriarca joined a conspiracy to handle a load of stolen cigarettes. He put up $22,000 but after the loot was obtained, the FBI seized it. Patriarca wanted to know from nothing. He was only a partner in profits, not losses, and the other conspirators had to scrape up $22,000 to pay him back. Still Patriarca could himself exhibit respect toward older dons, even though they were retired and played no more role in crime and could do no more than sit around on chairs on the sidewalk. Patriarca saw that they got their cut and an envelope out of some kind of mob racket. If there was a serious mob problem, he also called them in for consultation. He knew they were familiar with the members of organized crime all around the country and their characteristics. Teresa said that Patriarca felt gratitude toward them: "They got the town [Boston] in the bag, and it's been in the bag ever since. They were the ones who made the connections with the police departments. They'd had connections in the district attorney's office for thirty or forty years. They made the mob." One Mafia boss who always demanded the trappings of respect was Carlo Gambino. In that sense his mob presence was far different than his public image of a mild, turn-the-other-cheek, vulnerable little man. But he was transformed in mob contracts. He followed all the demands of honor his position commanded and exercised the little-known points of honor among mafiosi. If he shook hands with a person he did not accept, he turned his palm under the other's, making it clear he was merely going through the motions. If he accepted the man, he shook hands by putting his own palm on top. Again, though, Gambino's main interest in honor lay in the requirement of payment as a sign of respect. He granted a subordinate, Joe Paterno, supervisory rights for the crime family's affairs in much of New Jersey. Paterno was expected to hand over a certain percentage of the take. If the amount stipulated was 25 percent, Paterno turned over that amount religiously. Similarly, criminals operating under Paterno had to do the same. One criminal engaged in long-term looting of a manufacturer's warehouse had to get Paterno's approval to operate. He also had to show respect by paying Paterno 10 percent of what he stole each week. Paterno was rather easygoing about it. As the criminal later related, when he gave Paterno $200 at the end of the week it meant he had taken in $2,000 in total. Paterno never questioned the mobster's word. Actually, he was cheating Paterno and Paterno probably knew it. But on the other hand Paterno was getting 10 percent of something for doing zero percent. That was respect.